Donnis' Story "All Back To The Smile"
I grew up in Mississippi. My dad was from Mississippi. My mom was from Mobile, Alabama. I was born in Mobile. We lived so way back in the woods there wasn’t nobody. There was just pine trees, rattlesnakes, alligators and buzzards. I came to Missouri - my oldest sister, she’s going deaf and blind - she’s in Mt. Vernon, up there in an old folks home. I came to be closer to her. My brother, the only brother I got - he’s the oldest. He’s 15 years older than I am. I looked at my brother and said, “Dude, you know what man?”, he said, “What?”, I said, “You’re my brother whether you know it or not. You know, you got to deal with me. I ain’t got to deal with you.” I came to Springfield because of him and my sister. That’s how I got from Mississippi to Missouri. The hardest thing about being homeless is not finding yourself. Not finding that happy place, you know, where you can be you all the time. Cause I’m me. I’ve learned to always be aware. Always know your surroundings. Advice I would give to others? The magic to all of it? It’s a smile. You know what I’m saying? If you can’t find that, you got a problem. It’s not the world, it’s you. What do I think of when I hear the word love? Well, love to me is like a ray of sunshine and a smile. If I can make someone smile that don't even know me, they will remember me the next time they see me. And that is the love that I see. But when we talk about the word love, coming up... I didn't have it nowhere - all back to the smile. I had to find my place and I found it. If I gotta burn in hell for it, then I am gonna burn dude, because I have been happy for so long - ain't nobody can take it away. These streets made a monster out of me - the monster made out of love...you know what I am saying? I love me. It's all cool. 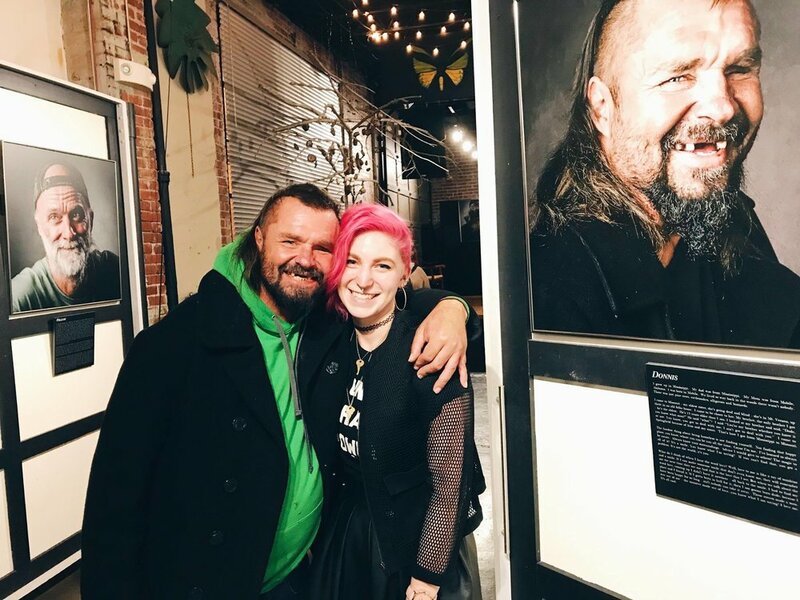 Since sharing his story over a year ago, not only has our good friend Caveman continued to actively be a part of our weekly lives by stopping in to hang out, attending our events and meeting people who were touched by his story, but as of this past year, he has also been living in his very own apartment! The week he signed the lease, he walked into our studio to dangle his new set of home keys for his apartment in front of us with that huge lovable smile. Cave is still filled with so much joy that whenever he’s around, you can’t help but be equally filled with his pure joy for life and smile at his contagious laugh. We are so honored he chose to share his story through 7 Billion Ones, honored to call him friend, and so hopeful and happy for his bright future. Donnis' story is part of the significant project "The Road I Call Home" which aims to bring new awareness, action, resources and love to the many, many special homeless people that call the road their home. It features over 45 individuals and includes an art exhibition of portraits, written stories, short-films and a planned future release of a corresponding coffee table art book. The project is in partnership with Gathering Friends for the Homeless. A special thank you to Bubba Kadane from Blindfold Sound for graciously contributing the music in the short film.